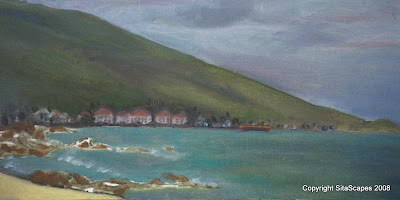 SitaScapes: "Voggy Day in Kona"
Artists Comments: From the shores of Old Airport Park, there is a wonderful view looking across Kailua Bay at the Kona Commons condominiums with Hualalai mountain raising up from the shoreline. The day was particularly voggy resulting in a gloomy hue that hung over the bay. I decided to capture the gloominess and catalogue what I hope to be a short-term vog spell.